This article addresses the need for reasonable adjustments, and other issues, by using examples of a hospital passport, assessing the mental capacity of a person, and how to improve care provided and reduce clinical risks for people with intellectual disability. “It is no use saying, we are doing our best. You have got to succeed in doing what is necessary.” Winston Churchill. These words ring true today in relation to people with an intellectual disability, and reducing clinical risks associated with care whilst in an acute hospital setting. Clinicians must do what is necessary, and thereby doing what is required for all people being mindful of the need to adapt services, and the care they provide to ensure reasonable adjustments are made to enable more positive outcomes and experiences. This article addresses these, and other issues by using examples of a hospital passport, assessing the mental capacity of a person, and how to improve care provided and reduce clinical risks for people with intellectual disability. Clinicians regularly grapple with assessing a person’s capacity, and encounter difficulty in understanding what constitutes a person’s best interests. This article sets out ways of addressing these fundamental issues and methods to improve the care provided as well as reduce clinical risks such as diagnostic overshadowing. Diagnostic overshadowing occurs when a clinician makes the assumption that a person with intellectual disability’s behaviour is a part of their disability without exploring other factors such as biological determinants. Gates and Barr (Learning and intellectual disability nursing. Oxford: Oxford University Press, 2009.) have noted that diagnostic overshadowing is particularly pertinent when new behaviours develop or existing ones increase. Given that people with intellectual disabilities have a much higher risk of experiencing a variety of diseases and conditions it is vital that physiological or pathological determinants in behaviour change are explored. If they are not people with intellectual disabilities suffer poor care and may even die when their death could be avoided. People with intellectual disabilities are more likely to experience major illnesses that necessitate hospital admission. (Disability Rights Commission. Equal treatment: closing the gap. London: Disability Rights Commission, 2006.) In 2001, the Department of Health reported that people with intellectual disabilities get a ‘worse deal’ from health services than the rest of the population. (Department of Health. Valuing People. London: HMSO, 2001.) Despite this, 2007 saw the publication of ‘Death by Indifference’ (Mencap. Death by Indifference. London: Mencap, 2007) which outlined the case histories of six individuals with intellectual disabilities who Mencap and the families felt died in healthcare settings from avoidable conditions. Still yet later Mencap published ‘Death by Indifference: 74 deaths and counting’ (Mencap, 2012) this is a stark reminder of the effect healthcare inequalities continue to have on people with intellectual disabilities. The Mencap report highlighted frequent failings such as ignoring vital advice from families and an inability of staff to meet basic care needs. Diagnostic overshadowing has led to individuals’ untimely deaths. More recently, the Confidential Inquiry into the premature deaths of people with learning disabilities, CIPOLD (Heslop P, Blair P, Fleming P, et al. Confidential inquiry into premature deaths of people with learning disabilities (CIPOLD). Bristol: Norah Fry Research Centre, 2013) identified the mean age of death of people with intellectual disabilities (65 years for men; 63 years for women) as being significantly less than for the UK population of 78 years for men and 83 for women. As a result, men with intellectual disabilities died, on average, 13 years sooner than other men in the general population and women with intellectual disabilities died 20 years younger than women in the general population. CIPOLD found the most frequent reasons for deaths being viewed as premature were: delays or problems with diagnosis or treatment; and difficulties with identifying needs and providing appropriate care in response to altering needs. In addition CIPOLD highlighted a lack of reasonable adjustments to facilitate healthcare of people with intellectual disabilities, in particular when accessing clinics for appointments and investigations was a contributory factor in a number of the deaths they investigated. Key issues arising from this in relation to clinical risk is the lack of coordination of care across sectors and between the varying disease pathways and service providers and the single episodic nature of care provision (CIPOLD). A lack of clarity between services can lead to fragmented pictures of a person and their quality of life which may cloud clinical decision making. Some clinicians base their decisions or are perceived to base their decisions regarding a person’s care and treatment on their quality of life; this is highly problematic. It is, as Blair discussed (Blair J. Service quality. In: Talbot P, Astbury G and Mason T (eds) Key concepts in learning disabilities. London: Sage, 2010, pp.219–224), easy to make assumptions about an individual’s quality of life but these are frequently formed by our own perceptions which may be inappropriate. In turn these are likely to colour our judgements about the support, care and treatment of individuals. As a result it is essential that the person themselves, and those who know them best, are involved in that care so that a more rounded picture of a person’s life can become apparent. This should yield a significant improvement in the care and treatment and reduce the incidents of diagnostic overshadowing, discrimination based on disability and likelihood of avoidable deaths. The majority of issues raised within this article are pertinent to clinicians working in children and adult services across different clinical settings. The case examples can be used by clinicians within their practice to enhance the care provided and ensure a reduction in clinical risk. There are a number of people who frequently are perceived to have an intellectual disability who do not and these are people with dyslexia, dyspraxia, attention deficit disorder, Asperger’s syndrome or challenging behaviour. Similarly, people with a physical or sensory impairment do not qualify as having an intellectual disability unless they also have an intellectual disability. - Is the individual known to the intellectual (learning) disability services? - Does the individual have significant communication difficulties? - Does he or she go to a special school, a mainstream school with special support or a day centre? - Does the individual have a social worker, care manager or key worker? If a clinician has any doubts about these questions and answers provided then they should contact the hospital learning disability nurse, their local community learning disability team, or social services to seek more information and guidance. Once clinicians are clear about a person’s intellectual disability there are various core things that need to happen when caring for such individuals. - Find the best way to communicate – with the person, their families, carers, friends. NOT everyone speaks so use photos, signs, symbols, Books Beyond Words series and pictures alongside speech. - The person, family and carers are EXPERTS – they can help interpret signs and behaviours that may show distress or pain. - Make reasonable adjustments – e.g. a quieter place to wait and to be seen in, minimising waiting times. In order to reduce clinical risk, and ensure that care is provided in a focused patient-oriented manner, it is essential to make reasonable adjustments. Equal treatment does not mean treatment should be the same for all. In order for people to be able to access the treatment they require adjustments are often required. These adjustments are required to be made under UK law, the Equality Act of 2010, so they are a requirement not merely a nice thing to do. At St. George’s there are a set of core reasonable adjustments. This does not mean that bespoke patient specific adjustments are not made but that it is clear to all coming into and working in the hospital what are the central reasonable adjustments for people with an intellectual disability. Nonetheless these ensure that St. George’s staff are complying with the Equality Act, and ensure that people with an intellectual disability receive the adjustments to meet their needs. They also assist in reducing the anxiety experienced by people with intellectual disabilities, their families and carers as well as permitting them to clearly provide advocacy and emotional support to the person with an intellectual disability during their time in hospital. This enables and ensures that staff working with the patient is more fully aware of the person and how best to engage with them. - No fixed visiting times for family, carers and friends of people with intellectual disabilities. This general approach permits people to be with the person with an intellectual disability as much as they wish and ensures greater understanding of the person’s particular needs. It provides clinicians with vital information and thereby reduces the likelihood of clinical risks. - Food and drink for family and carers is offered to ensure that they can remain with the person at anytime during the day/night. - The first or last appointment of a clinic should always be offered, so people who find it difficult to wait do not have to. - Double appointments are particularly useful in reducing the risk of diagnostic overshadowing as more time permits greater exploration of often complex issues which in turn should reduce clinical risks and result in more effective treatment. - A bed and/or chair is provided for a carer or family member. Hospital passports, adapted from the one created by the then Gloucestershire NHS Primary Care Trust, and introduced at St.George’s in 2008, are vital in aiding clinicians to care for effectively, and in partnership with the individual themselves and their carers. The passports were developed in partnership with people with intellectual disabilities, their carers and community and hospital-based staff. They are completed by the individual and their carer preferably prior to admission and can be acquired through GPs, Community Learning Disability Teams, day services as well as care homes in the local area St. George’s Hospital. Ninety-five per cent of people with intellectual disabilities who come into St. George’s come in with hospital passports, or similar documents. They provide a comprehensive portrait of the person and cover aspects other than health such as likes and dislikes, as well as how communicating with the person, and vitally how they express pain. Passports change care directly because of what is contained in them. They provide clinicians with a core history of the person. Such documents enhance patient safety. Stephan has a severe intellectual disability and makes a lot of verbal sounds that can be difficult for people to interpret who do not know him. When he is in pain he often laughs which many clinicians took to be a sign that he was not in pain until they read in his hospital passport that in fact this is an expression that he is experiencing significant pain. Clinicians then met with Stephan’s carers to explore his laughter and understand how the degree and intensity of the laughter can indicate different levels of pain; this enabled clinicians to manage Stephan’s pain relief and ensure his safety. Fatima has a moderate intellectual disability, and following a hip operation needed to go to a specialist rehabilitation service to ensure she recovered to the optimum level. The rehabilitation service were reluctant to provide a place until they were sent through a copy of the hospital passport which detailed how she had been prior to her operation and therefore appropriate bespoke rehabilitation goals could be set that are achievable for Fatima. Michael has a mild intellectual disability with autism and was at the key transition, child to adult, phase in his life. This can be a problematic time in a person’s life, and for clinicians very difficult as services are changing and the clinicians who knew Michael as a child will no longer be involved now he is an adult. The presence of a hospital passport enabled the clinicians who were getting to know Michael to have a picture of him as he and his family saw him. This along with other records enabled clinicians to see the whole person and thereby work out the best methods of working with Michael to achieve the best and safest outcomes for him. Passports or similar documents can also contribute to discussions about what is in a person’s best interests as well as what they may have wanted should they be assessed as lacking capacity regarding their care and treatment. This aspect of working with people with intellectual disabilities causes clinicians a great deal of anxiety but if undertaken properly can significantly reduce clinical risk and ensure safe lawful practice. CIPOLD identified that there is a paucity of adherence and knowledge of the Mental Capacity Act, 2005 among clinical staff and the particular aspects are in relation to assessments of capacity, the process of making ‘best interest’ decisions as well as when to an Independent Mental Capacity Advocate (IMCA) should be instructed. IMCAs are a legal safeguard for individuals who lack capacity to make some important decisions which include where they reside and serious medical treatment in the absence of family or friends who can represent them. IMCAs may also represent people who are the focus of adult protection proceedings and safeguards. Under the Mental Capacity Act 2005 there are a few core principles which must be adhered to. An individual must be presumed to have capacity unless assessed otherwise, a person must be supported to have capacity, people are entitled to make unwise decisions and the decision pathway needs to be documented. If capacity is in question, clinicians need to carry out a four point capacity test. Understand the information relevant to the decision? Retain the information long enough to make the decision? Use or weigh up the information? - Can the decision be delayed if the person may regain capacity? It is essential to remember that each decision is time location and decision specific. Just because a person may lack capacity at one time about one particular decision, it does not mean that they lack capacity in other areas or aspects of their life. Martha has a mild intellectual disability and came into hospital to have some teeth removed. Martha was able to state without prompting what was going to happen to her, how it was going to happen, what would happen after the teeth were removed and state whether or not she wanted to have the teeth removed as well as what the risks and benefits were to their removal. Martha used pointing, e.g. opening her mouth and pointing to the teeth and saying ‘they are coming out’, ‘they are not good teeth’, ‘I will be asleep (when it happens)’ and ‘I will be better without them.’ This shows that Martha has a clear understanding of what is happening and would like to go ahead with the treatment as planned. Edna has a mild intellectual disability and schizophrenia. She has come into hospital as a day patient for an endoscopy. Her speech is hard to follow but using a sign and pointing to her throat and stomach she was able to indicate clearly that she knew what was being proposed ‘camera in my mouth going to my tummy’, ‘to see if it is ok’ and ‘I am worried about it hurting but want to have it. . .to get better.’ Here it is clear that Edna wants to have the procedure but has a worry about it hurting. This worry was addressed and she had the treatment. If an individual is assessed to have capacity and decides not to have a proposed treatment option clinicians must not proceed even if they consider the person to be making an unwise decision. LD Our Health Our Hospital was created by the author in March 2010 to work with him to improve care experiences and outcomes of people with intellectual disabilities in the hospital. There are six people with an intellectual disability, four parents and two chief executives of local intellectual disability charities. The group is co-chaired by two people with intellectual disabilities with two co-vice-chairs, one a mother, the other a chief executive of a local charity. Meeting every two months the focus is on knowing what is happening in the hospital, what needs to be changed and what is going well, being involved in planning services, meeting commissioners, aiding in the evaluation of the services provided and sharing good and bad experiences in order to improve care in the future. Members are on the hospital’s access committee, patient reference group, kidney patients’ association and teaching health care students and clinicians within the hospital. The panel has ensured that the hospital has beds for carers of people with intellectual disabilities so they can stay overnight. Members of the panel assisted in adapting and rolling out the hospital passport, speak at conferences, and share their experiences in national policy-making arenas. This illustrates the impact those who use services can have on the planning, delivery and evaluation of services which can only improve outcomes and lead to safer better care. - Assess people’s health and wellbeing so that any changes in behaviour that may signify changes in condition or an illness are not considered to be signs of their intellectual disability. This article has explored some key issues in working with people with intellectual disabilities and how to minimise clinical risk and ensure care is provided in an appropriate timely and lawful manner. Through examples from practice this article has set out ways of reducing risk in clinical settings and methods by which clinicians can get it right for people with an intellectual disability. If clinicians ensure that they get it right for people with an intellectual disability it will be much better for everyone else they care for as well. It is vital that each clinician takes heed of the fact that they cannot make judgements based on a person’s quality of life but must come from a starting point that everybody’s life has worth. It is only then will a significant reduction in clinical risk such as diagnostic overshadowing take place alongside positive reasonable adjustments and improved health outcomes. People who use services must be at the heart of the significant cultural change that is required to ensure greater patient safety and a reduction in health inequalities. Including people in their care, the planning, delivery and evaluation of care must become embedded within the thinking and structures of all so it becomes a matter of course rather than an ad hoc approach as it is often now. Every service should consider developing a panel like LD Our Health Our Hospital and a senior clinician specifically qualified to work with people with intellectual disabilities who can provide clinical leadership, accountability, and expert guidance regarding how to enhance care provision for people with intellectual disabilities and their families. 1 Independent Inquiry into Access to Healthcare for People with Learning Disabilities. Healthcare for all? London: Aldridge, 2008, p.7. 2 Gates B and Barr O. Learning and intellectual disability nursing. Oxford: Oxford University Press, 2009. 3 Disability Rights Commission. Equal treatment: closing the gap. London: Disability Rights Commission, 2006. 4 Department of Health. Valuing people. London: HMSO, 2001. 5 Mencap. Death by indifference. London: Mencap, 2007. 6 Parliamentary Health Service Ombudsman. Six lives: the provision of public services to people with learning disabilities. London: Parliamentary Health Service Ombudsman, 2009. 7 Mencap. Death by indifference: 74 deaths and counting. London: Mencap, 2012. 8 Heslop P, Blair P, Fleming P, et al. Confidential inquiry into premature deaths of people with learning disabilities (CIPOLD). Bristol: Norah Fry Research Centre, 2013. 9 Blair J. Service quality. In: Talbot P, Astbury G and Mason T (eds) Key concepts in learning disabilities. London: Sage, 2010, pp.219–224. 10 World Health Organisation. Classifications: international classifications of diseases-10, www.who.int/classifications/icd/en (2010, accessed 2013). 11 Blair J. Caring for people who have intellectual disabilities. Emergency Nurse 2012; 20: 15–19. 12 Hardy S, Woodward P, Woolard P, et al. Meeting the health needs of people with learning disabilities: RCN guidance for nursing staff. London: Royal College of Nursing, 2011. 13 Blair J. Care adjustments for people with learning disabilities in hospitals. 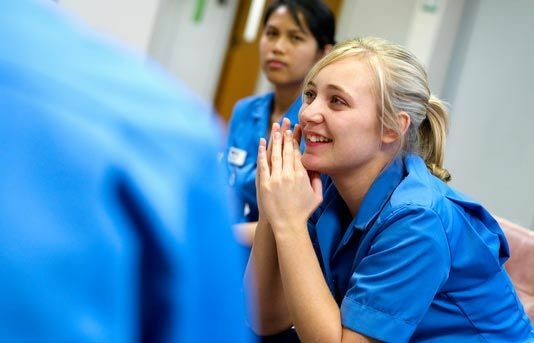 Nursing Management 2011; 18: 21–24. The final, definitive version of this paper was published in Clinical Risk, Volume 19/Issue 3, May 2013 by Sage Publications Ltd, All rights reserved. © Published on this website in May 2014.